05-Dec-2014 -- After my fun but tiring visit to 30S 115E, I spent the night in the small town of Dongara, just south of the next line of latitude - 29 degrees South - so next day I decided to visit the two easy-looking Degree Confluence Points on this line of latitude, before returning to Perth. This confluence point lies in a farm field, 800 m from Connolly Road. 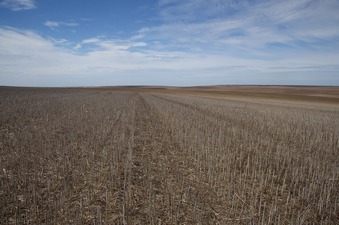 At the time of my visit, the field was filled with dead stalks from a crop harvest - sticking out of the ground in rows. Visible to the West, beyond Connolly Road, is a wind farm.